Vivo has revealed its Time of Flight (TOF) 3D Sensing Technology at MWC Shanghai 2018, with the promise of a paradigm shift in imaging, AR and human-machine interaction, which will elevate consumer lifestyles with new levels of immersion and smart capability. 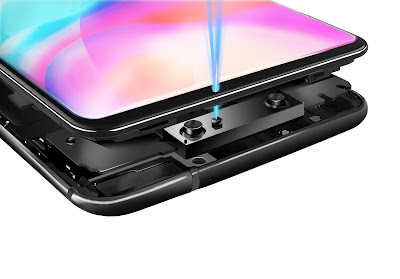 Vivo’s pioneering TOF 3D Sensing Technology detects the time it takes emitted pulse light to return to the sensor to accurately map objects at up to three meters in front of it. It enables new opportunities in facial, gesture and motion recognition, 3D photography and AR, expanding the capabilities of the next generation of smart devices. Vivo's TOF 3D Sensing Technology is no mere proof of concept. The technology is tested and meets industry standards required for integration with current apps soon. Beyond facial recognition, TOF 3D Sensing Technology will open up new possibilities for entertainment as well as work. A global smartphone brand focused on introducing perfect sound quality and ultimate photography with cutting-edge technology, Vivo develops innovative and stylish products for consumers around the world. Vivo currently has several R&D centers worldwide, including the United States (San Diego), and China (Shenzhen, Dongguan, Nanjing, Hangzhou and Beijing). As an Official Sponsor of the FIFA World Cup™, Vivo believes in the importance of encouraging young people to embrace self-expression and an energetic lifestyle. In the Philippines, Vivo is the top 3 smartphone brand in terms of market share with 1.5 million users nationwide.